As part of the development of eXtensible Catalog (XC), a project sponsored by the University of Rochester's River Campus Libraries, four institutions conducted 80 interviews and numerous workshops to understand how researchers learn about, acquire, and use scholarly resources. Research findings informed the design and development of XC, a set of open-source applications that provides access to resources across a range of databases, metadata schemas, and standards. 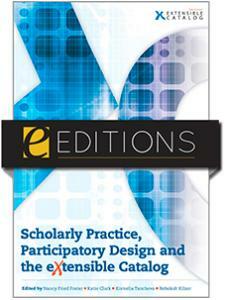 In this volume, members of the project team report on key findings of the user research that was done at Cornell University, Ohio State University, the University of Rochester, and Yale University, and discuss the value of including library users and technology specialists from many disciplines in the software design and development process. This book is appropriate for academic librarians, academic libraries, schools of information science and librarianship, library educators, and researchers. Why Do User Research for the eXtensible Catalog Project? Nancy Fried Foster is lead anthropologist at the University of Rochester River Campus Libraries. Katie Clark is the Associate Dean for Public Services and Collection Development at the University of Rochester. From 1999 to March 1, 2008, she was the Director of the Science and Engineering Libraries. Katie was a member of the Undergraduate Work Practices team and contributed to two chapters of the book, Studying Students: The Undergraduate Research Project at the University of Rochester. Prior to coming to Rochester, Katie worked at the University of Houston, Pennsylvania State University, and Texas A&M University Libraries. Kornelia Tancheva is the Director of Olin and Uris Libraries at Cornell University. Previous positions include Director of the Collections, Reference, Instruction, and Outreach Department at Olin/Uris, and Instruction Coordinator at Mann Library, Cornell University. Kornelia holds a PhD in Drama and Theatre from Cornell University, and MLS from the Syracuse School of Information Studies, and an MA in English Language and Literature from Sofia University, Bulgaria. Kornelia teaches classes in drama, theatre, and ESL and her research interests include modernism in drama and theatre, human-computer interaction, theatre in the age of the Internet, as well as qualitative and quantitative assessment of library services. Rebekah Kilzer led the XC User Research team as the Systems Librarian at The Ohio State University. She is an adjunct lecturer at Drexel University’s iSchool, where she has taught the cataloging and metadata courses. She is currently the Manager of Partnership Program Development at the Drexel University Libraries, where she works to improve the user experience through systems, services, partnerships and collaborations.